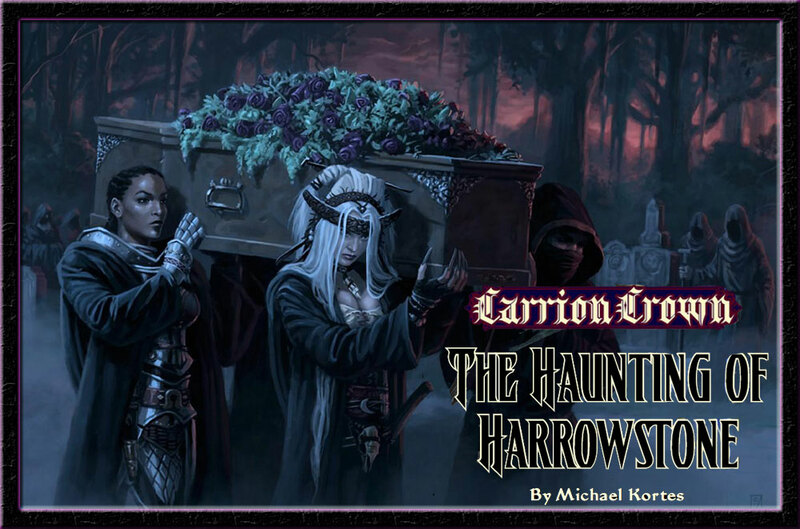 An all new crop of characters makes its debut as we kick into Carrion Crown! I am the troubled Vudran girl named only “Sredni Vashtar’s Girl,” as she is owned body and soul by her god/familiar, the weasel Sredni Vashtar. Chris is playing Icobus Basilisk, a battle oracle type; Bruce is playing Oswald Bainbridge the crossbowman; Patrick is playing Nigel Snodgrass the dirge bard; Tim is playing Dr. Jegen Vaus the eccentric alchemist; and Matt is playing Vladimir Vampijérovic the hungry ghost monk. Character sheets are all on the campaign page for those that provide them. This entry was posted in session summaries and tagged actual play, adventure path, Carrion Crown, horror, Lorrimor, murder, Paizo, Pathfinder, prison, Ravengro, RPG, RPGs, session summary, spooky, story time, Ustalav. Bookmark the permalink. My group is on the penultimate book now — we’re playing a bit later today — and we’ve had good fun with Carrion Crown. It’s a bit more linear than other Paizo campaigns we’ve played but it has some fun ideas, encounters and locations and it’s dripping with gothic horror atmosphere. Have fun!